Dr. Thavamani D Palaniswami is a Paediatrician and Adolescence Care Specialist. She did her M.B.B.S at Kilpauk Medical College, Chennai and M.D Paediatrics in U.S.A (American Board). She has 14 years of long service in the major hospitals in United States of America. Her valuable work experience in the medical institutions of USA has empowered her skills in managing various medical and technical institutions. 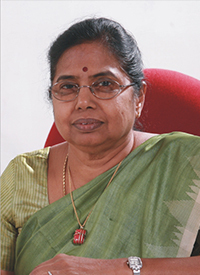 Dr.Thavamani D Palaniswami, Secretary , Dr.N.G.P. Educational Institutions received an award by The Times of India "ANGELS OF CHANGE " on 25th November 2015 ; for her exemplary commitment and impactful positive contribution to education in Coimbatore. Dr.Thavamani D. Palaniswami, Vice Chairperson of Kovai Medical Center and Hospital, Coimbatore, was conferred The Hindu's 'Women of the Year' award. The award is to honour a woman of substance in commemoration of the International Women's Day.